Nicholas R. Galasso - GALASSO P.C. Mr. Galasso began his practice of law focusing on commercial litigation, business and corporate law, estate planning, probate, association and condominium law, and residential and commercial real estate. 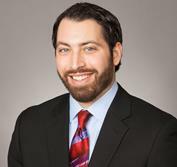 Soon thereafter, Mr. Galasso incorporated family law into his practice concentrations. During law school, Mr. Galasso was a clerk for the Honorable John W. Darrah of the Federal District Court for the Northern District of Illinois. Mr. Galasso’s educational background in both accounting and economics brings a unique and sharp business and financial perspective to all of his practice areas.